Nothing on this page will make sense if you haven’t read The 3% Signal. If that’s you, please read the book and return here when you’re ready to begin this life-changing new approach to stock market investing. Single-Page Printable Version of Mark’s Plan. Below is a link to the single-page printable version of Mark’s plan that you read about in Appendix 1 of The 3% Signal, page 299. It might be helpful to keep handy when rereading Chapter 7 of the book. Your 3% Signal Plan Spreadsheet. IMPORTANT: The formulas in the first three data rows are different from each other because they need to get you started in the plan. Once you’ve filled in the third data row with your own data (Row 4 in the sheet because Row 1 contains the headers), you’ll be able to keep copying and pasting that row’s formulas in all subsequent rows. Only Rows 2 and 3 contain special formulas for use in the starting phase. Begin your plan in Row 2. 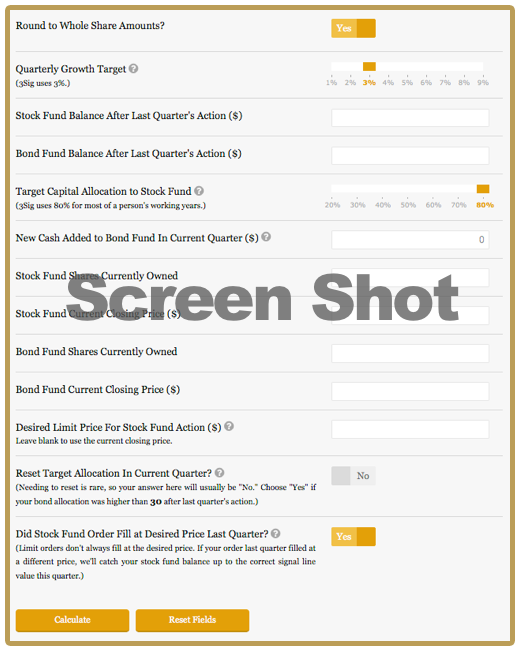 Type in the quarter, SPY price, and then the prices and dividends of the stock and bond funds you’re using (IJR and VFIIX in Mark’s sample data). After that, type in your allocation to the stock fund in Cell I2 and to the bond fund in Cell P2. One quarter later, move to Row 3. As before, add the quarter, SPY price, and then the prices and dividends of your funds, then your quarterly cash contribution in Cell H3. That’s it. Once the row has these inputs, it will automatically calculate everything else and tell you in Column M what to do that quarter. I recommend highlighting cells with manually-entered data for easy checking later. Cell H3 should be highlighted already in your sheet, but might not be if the spreadsheet software you’re using didn’t import the file correctly. The shading key at the bottom of the sheet shows recommended colors and situations in which to use them. One such situation is the “30 down, stick around” rule, which you saw Mark follow by skipping four quarterly sell signals from Q203 to Q104, and Q209 to Q110. Notice on his sheet (available in the previous section and in Appendix 1 of The 3% Signal) that he needed to add the adjustments in Column N and made note of this in Column L. He also highlighted that the cells in Columns Q and W were affected by these changes. I recommend following this convention when managing your sheet as well. Once you’ve done this one time, you can then just copy and paste the modified cell formula for later usage. Having highlighted the cells will make the modified ones easy to find in the future. New! I now offer a version of the sheet that makes this adjustment for you automatically, with dynamic formulas in Columns Q and W. You’ll find its link in the Google Drive section below. Don’t want to update the formulas in Columns Q and W yourself, as explained in Bullet 6 above? Then download this version of the sheet. I’m still offering the non-automated, original version as well because some readers said they prefer updating manually as a way to better understand what’s going on. Just about any spreadsheet software can open this file format. Run Your 3Sig Plan In Canada. I have a question regarding performance over a period of time. I am currently investing into SCHA and SCHZ, however the SCHA vs IRJ are vastly different in performance over the YTD, 1yr, and 2 yr. It would seem as though on that invested into the IJR have more growth…. and having it been over time, would have higher cumulative annualized returns. SO, bale out on SCHA and transfer over to IJR or leave it be? I did not see this comment until now. My apologies! I have always preferred IJR as my small-cap fund, partly for the reason you state. It used to cost a bit more than SCHA and VB, but not anymore. Plus, it’s a little more volatile than other small-cap funds, and my plan puts that volatility to work by buying the lows and selling the highs. The lower and higher they are, the better the plan performs. So there’s basically no reason to use anything other than IJR. You book, webpage, and PDF’s mention that the 3Sig Calculator is free to use (which I am/was very-much looking forward to), but if I’m not mistaken, it looks like the 3Sig Calculator is only available with a purchased subscription to “The Kelly Letter” now. Am I correct to assume the 3Sig calculator isn’t free for anyone to use anymore, or have I missed something very important? My books, etc. don’t say the calculator is free to use. I mentioned in my book, The 3% Signal, that I offer spreadsheets and other tools on my website, but not that they’re free. I did offer both spreadsheets and the calculator for free for a couple of years following the book’s publication, but made the calculator part of The Kelly Letter paid service a year ago. If you would like to have a free look at it (along with everything else on the subscriber site), please email me and I’ll provide you with access. Thank you for your reply, and my apologies for the confusion. I have sent you an e-mail. I tried to paste a screen shot but couldn’t make it work so i just copied the text. It’s not a problem for me since i subscribe but it does send you on a wild goose chase when you try to find the free calculator. Where did you find the “still free and amazing” text? I don’t see it anywhere. It’s left over from when the calculator was free. It’s now part of the Kelly Letter subscription (and still amazing), and I will change that text if you can point me to where you found it. If one is about to start the plan, given that interest rates most likely will be rising, will this impact the returns of the bond fund? To date it is down 2+%. Changing interest rates and moving bond-fund prices do affect performance, but not in a way that changes the plan. Sometimes the fluctuations work in the plan’s favor, such as when bond prices are slightly down and there’s a sell signal that moves money from rising stocks to slightly falling bonds. Also, over time rising bond yields offset declining bond prices. Through many time frames tested, simply continuing with bond funds as the safe repository worked best. As usual, following the financial media obsession with a non-issue will harm your performance. They’ve been waning of a bond-market crash for five years. They’ve been wrong. The Sig plans have hummed along through their warnings. They’re still warning. The Sig plans are still humming. Bottom line: Stick with a bond fund, per the plan. I purchased the Kindle version of your book, The Neatest Little Guide to Stock Investing. I am frustrated because I cannot print the worksheets no matter how hard I try. I can’t even print the page with the worksheet in order to read/recreate myself. Can you help me out here? Sorry to hear about this, Darlene. I’ve read your book, The 3% Signal, and looked over the webpage on the 3Sig Tools. I can’t find any reference for how to account for cash withdrawals from an account. As you state several times in the book, using a retirement account is ideal for your system, but such an account will be subject to eventual periodic withdrawals. I’ve played with your spreadsheet a little, trying to use Column D and Column F to enter negative share amounts to account for sale/withdrawal of a portion of the account balance, but entries have a geometric rather than arithmetic effect (large negative numbers have a disproportionate impact). Using Column H might do it. I’m just not good enough with spreadsheets to figure it out. It’s true that the spreadsheet is not set-up to account for the withdrawal phase of the plan. I recommend withdrawing needed cash by selling shares of the bond fund only, which should provide plenty of balance during your higher-bond-balance retirement years. When the plan signals a sale of the stock fund, you could sell more than specified if the bond balance is running low. The usual imbalance happens by the bond balance becoming too big, but may not be the case during the withdrawal phase. I hope this helps, and wish you a happy retirement. Jason … do you check this page for comments? It’s been two months exactly since I posted a comment/question (2/19/19). Could you respond to it? I apologize for the delay, Phil. I did finally see your comment and reply.